Of course it’s not mere coincidence, that to non-Korean ears the name of the South Korean capital sounds very similar, if not identical, to the English word soul. 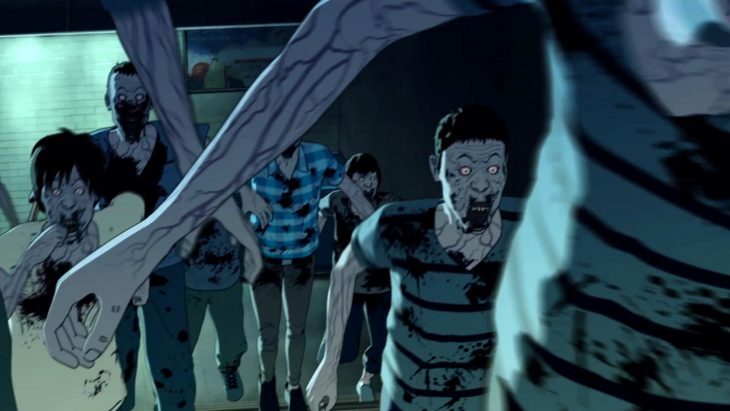 But don’t be alarmed: Yeon Sang-ho’s animated horror movie isn’t meant to be a play on words wrapped in a zombie comedy, but turns out to have deep roots in the subversive, sociocritical origins of movies about the undead. Seoul appears therein as a cosmos dominated by a ruthless pecking order: In the eponymous train station the homeless prepare for the night under the watchful eye of the police. One of them seems to be in particularly bad shape, another one tries to organize some pain killers for him. When he returns, the sick man has vanished. A little later he reappears in an alley bent over a corpse and smacking his lips. Meanwhile a young man is trying to convince a female runaway to work the streets again. They too are caught unawares by the zombie epidemic. Since the policemen don’t (or don’t want to) recognize what’s going on, it’s up to the outcasts of South Korean society who slipped through the cracks of the bureaucratic welfare state to oppose the threat. “Seoul Station” is a frenetic zombie thriller, whose gripping and shocking derailment scenario sends a sociocritical storm of protest directed towards today’s South Korea. By the way Yeon Sang-ho’s first movie “Train to Busan” is set in the same zombie epidemic!